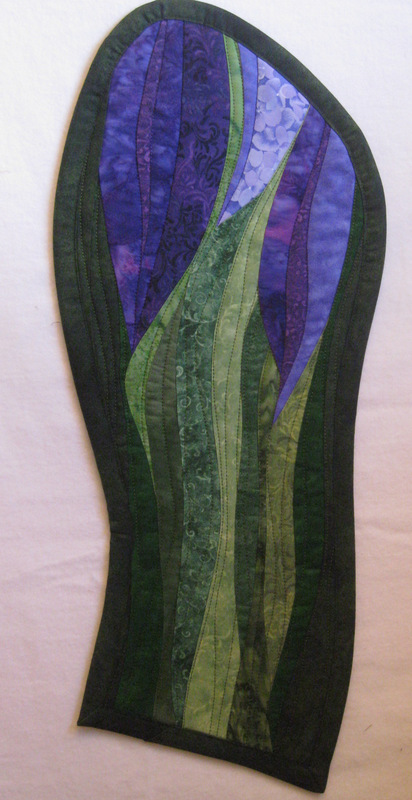 I have been experimenting with curved outside edges for my wall art quilts. Many designs don’t lend themselves to this option because their design works fine as a squared off wall quilt. But with some of my curved piecing I’m wondering about continuing those curves to the outside edges. I did this with a recent triptych design and liked the effect as did many customers who commented about it at a recent festival. Today I tried making “Curved Purple Flowers”. This is a small quilt with lots of big curves. I like the curves on the outside but I’m not sure I selected the right purples for the quilt. I think the flower on the left may be too dark and needed more contrast against the dark green “leaf” background. I will have to try this design again and see what I think! !